How do you know which investment company to work with? This is an important question. Selling your house is a big deal. It is important that you know that you are dealing with a reputable company. I get calls every month from people who tried working with a fast talking Real Estate Investor. This investor made big promises but in the end, the deal didn’t close and the homeowner was left hanging. They call me looking for help. The problem is that many investors can't get loans to buy houses, so they just try to make a quick buck by selling the house before they buy it. They just want to be the middle man. They have no intentions of closing on the houses they put under contract. It sounds crazy but it actually happens. Remember, not all ‘We Buy Houses’ companies are the same! Try to deal with only local companies. This makes checking up on a company much easier. I personally wouldn’t deal with someone who wasn’t local. Ask for and call references. A good company should have plenty of satisfied customers. I can give you a list of references a mile long. Want 30 or 40 references? I can give them to you! Read the contract very carefully. How much is the earnest money? How far away is the closing date? If they are really paying cash like they say they are why do they need to wait 30 days to close? Have a local attorney review the contract if anything looks suspicious. Don’t work with anyone who wants to put a sign in your yard and sell your house to someone else. That is just ridiculous. It is important to remember that not all Real Estate Investment companies are bad. When you work with us you will be able to tell from the very beginning that we take care of business. When we shake hands and write a contract on a house, we intend on closing that deal. We have the funds available to buy it. We do what we say we will do and our deals close on time. This is very, very important. We take the time to make sure that you understand everything. We want you to be comfortable doing business with us. We try to give you enough information so that if you can make an informed decision. If you do decide to sell to us you know you are making the right decision. Sometimes we even advise people to not sell us their house. I think that really surprises some people, but that's just how we do it. We have to live and work here in this community with the same people we help. We are very much a local company. People can stop by our office for a cup of coffee anytime. But the bottom line is that our deals close on time. We do what we say we'll do. That's why we are still in business. 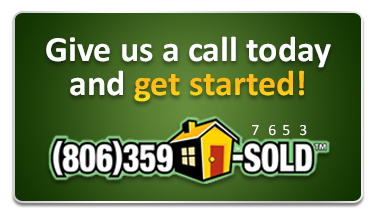 Call us today at (806) 359-7653 and let us help you get your house sold!